As a former staff newspaper photographer, I’ve been critical of rugged point-and-shoots in the past, but I must admit the Olympus TG-850 is really good. It takes razor sharp images, has impressive low-light performance and the on-camera flash is sufficient for indoor snaps. For such a small camera, it captures action well. When reviewing “rugged” digital cameras, my main questions are: Does the camera beat my (cased) iPhone for quick photos in nasty conditions? Is it easy enough to use to take solid pictures quickly? Will I be excited to pull it out of my pocket and by the images it creates? 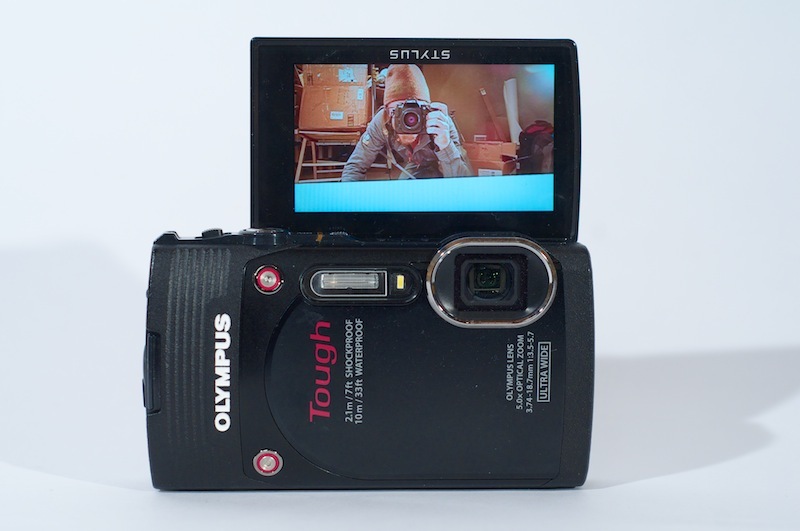 The answers when reviewing the Olympus TG-850 are yes. I tested this tough little shooter for a couple weeks in varied conditions, from sightseeing in San Francisco to skiing in the Rocky Mountains. Overall, it took good photos and was easy to use. 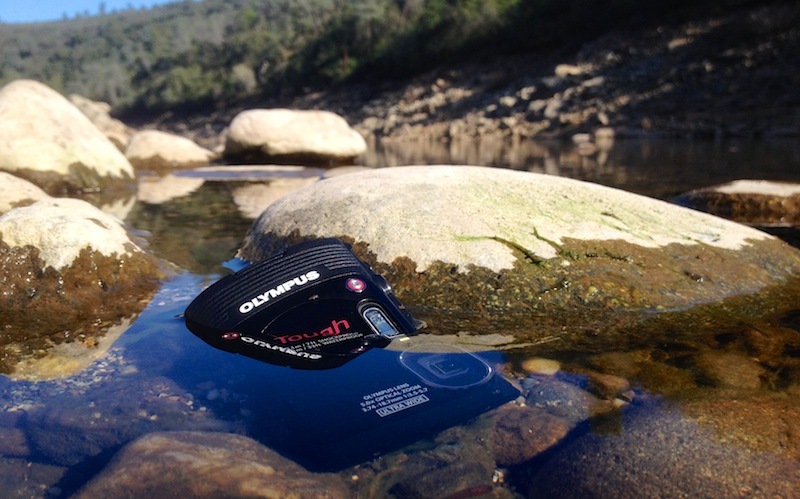 It is waterproof to 33 feet, is “crush-proof” to 220 pounds, can be dropped from seven feet and used in freezing weather to 14 F.
The technical stats on this camera are good and readily available from Olympus, but a few features are worth calling out: Its 3” monitor flips up 180 degrees, making “selfies” or low-angle photos easy (for example, a buddy holding a trout from just above the water line); the 21mm lens is a true wide angle (the company claims it’s the widest of a “rugged” camera); it can shoot up to 60 frames-per-second at three megapixels per photo (basically a video burst). Price: At $250, this is a middle-of-the-line offering from Olympus; the series of Tough cameras also includes the $150 TG-630, the $350 TG-3, and the $380 TG-2 IHS. Where To Test It: Hiking, snorkeling, skiing — pretty much anywhere outside. Who’s It For: Outdoors lovers who want better photos than a cell phone can provide but don’t want to lug (or worry about) a heavy SLR, mirrorless camera or fragile point-and-shoot. Boring But Important: Waterproof, drop proof, freeze proof, crush proof — unless you are really abusing this camera (or scuba diving) it will take what you throw at it. A flip-up LCD screen makes “selfies” easy (was this a problem before?). The 21mm super-wide angle is 25 percent wider than standard 28mm lenses found on other rugged cameras — it’s really noticeable. Important Specs: Captures up to 16-megapixel image stills and 1080/60P video. It has a 21mm super-wide lens, waterproof submersible to 33 feet, and shoots up to 60 frames-per-second at 3 megapixels. It fits easily in a pants pocket and is the size of a big cell phone. Killer! Quick and responsive camera. Settings are easy to change. Experienced photographers will appreciate easy access to exposure compensation, flash controls, white balance and high-speed shooting modes. The camera packs a lot of punch for the photographer who understands ISO, shutter speeds and f-stops. Flaw: I don’t like the location of the zoom toggle. The 33-foot underwater rating is great for just about everything — except scuba diving. Engineering for more pressure is tough, but 100 feet would make it way more scuba-friendly. First Impressions: This is a great point-and-shoot. The fact that it is also “tough” is a big bonus for those who spend a lot of time in the great outdoors. Who Should Buy It: Those looking for a quality point-and-shoot and don’t want to worry about rain, dust, mud, cold or impact.